For those unfamiliar with the one-time highly popular app, the Angry Birds game is not really about avians with bad tempers. Instead, it’s about using a slingshot to launch objects on your cellphone that sort of resemble birds at structures containing other objects that sort of resemble pigs in the hopes that the structures will come crashing down on the pigs. The good news is that The Angry Birds Movie expands this rather simplistic game into a 90-minute-movie with an actual storyline and decently (for a family animated film) developed characters. The bad news is that The Angry Birds Movie (1) still spends far too much time launching birds at the pigs’ various abodes, and (2) still isn’t really about angry birds. 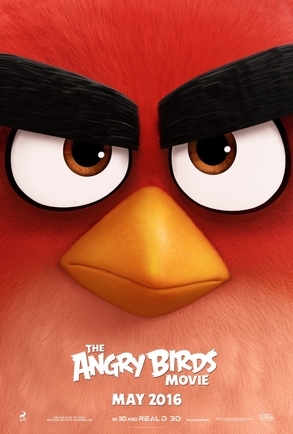 There is a grand total of one sort-of angry bird in the movie, a cardinal with bushy Eugene Levy-like eyebrows named Red (Jason Sudeikis). Red grumbles a lot and prefers to keep his own company, but for some strange reason, he gets hired as an entertainer at a kid’s birthday party. After he encounters one frustration another before arriving at the party, he pitches a fit and is sentenced to attend anger management classes. Red’s fellow students aren’t really that angry either, including two who become his friends. Chuck (Josh Gad) is a hyper goofball who resembles the Cocoa Puffs cuckoo, while Bomb (Danny McBride) actually unleashes bombs out of his you-know-what if he loses control. There’s also an incredibly fat bird named Terence (Sean Penn), who just grumbles a lot. Life on Bird Island changes when a ship bearing a pig named Leonard (Bill Hader), who claims he is a friend to the birds. Leonard comes bearing lots of presents, including a giant slingshot, much like what the aliens brought in the classic Twilight Zone episode, “To Serve Man.” Everyone accepts Leonard, with the notable exception of Red, who thinks Leonard is up to no good. To get some guidance as to what to do about Leonard, Red climbs up the tallest mountain on Bird Island to the lair of Mighty Eagle (Peter Dinklage), the legendary protector of the island. The trek proves a huge disappointment, since Mighty Eagle is now an overweight blowhard resting on his laurels. Red’s suspicions about the pigs prove correct when, in the midst of a big party (including a hoedown complete with a Blake Shelton tune), the pigs eggnap all of the birds’ future offspring on the entire island, with the intention of making a whole lot of omelets when they get back home. Red now becomes the birds’ de facto leader as they journey to Piggy Island seeking to get back their future young ones. Once there, you guessed it, Red and friends use the slingshot the pigs so graciously provided to launch themselves, one at a time, at the pigs’ castle. To succeed with mainstream audiences today, animated films need to appeal to both adults and youngsters. With its silly slapstick and seemingly endless shots of birds being catapulted into various types of buildings, The Angry Birds Movie will definitely succeed at the latter. Unfortunately, the dynamics of the video game make this portion of the movie even more repetitive than most animated movie action sequences. Seemingly, if you’ve seen one flying bird crashing into a building, you’ve seen them all. To make up for this repetitiveness, the filmmakers rely in part on some terrific animation and in part on some clever in-jokes and one-liners. The animated birds and pigs are quite carefully rendered, with marvelously expressive faces. This is especially the case with Red, whose mounting anger and frustration at times threaten to cause him to explode. The looney Chuck is almost as carefully rendered, while the patently phony smiles on the pigs’ faces show a subtlety not often seen in animated films. As far as the humor is concerned, as expected Angry Birds delivers pig and bird jokes galore (comments about Kevin Bacon and practicing “bird control”). The movie even has some meta vocal casting, with the notoriously disagreeable Sean Penn playing the similarly grumpy Terence (of course, since Penn only grunts and grumbles, the audience can’t tell it’s his voice), while Peter Dinklage is cast as the largest and most powerful bird on the island. Dinklage also turns Mighty Eagle into a puffed-up buffoon to an even greater extent than the script does. The rest of the supporting cast, especially Bill Hader, also have lots of fun. Unfortunately, the lead character Red, proves to be both underwritten and miscast. There’s no two ways about it: Jason Sudeikis is about as mellow and laid back an actor as you’ll find, not someone prone to Ralph Kramden-style meltdowns. And the script also pulls its punches in that regard as well. While Red winds up being provoked on numerous occasions in the movie, and the audience sees his animated features tensing and the steam building, the expected, and possibly hilarious, meltdowns almost never occur. Instead, Red only gets moderately perturbed and replies with some wearily cynical one-liners. The best of these one-liners occurs in what might otherwise be the tackiest scene in the movie. As often happens in animated films, the writers can’t resist taking the low road and throwing in a few bodily function jokes, the most notable of which is the running gag about Bomb’s explosive prowess. The best of these toilet humor jokes occurs when Bomb and Chuck go swimming in Mighty Eagle’s mountain “lake of wisdom.” unaware that the larger bird uses it as his urinal of wisdom as well. Red’s resigned one-liner when they realize their mistake is probably the funniest line in the movie. The Angry Birds Movie is juvenile and silly, but it’s also better than the vast majority of video game movies (not that this represents a particularly stunning achievement). However, it also represents a bit of a missed opportunity. The trailers sold the movie as a comic explosion waiting to happen, and, after 98 mildly amusing minutes, the audience will still be waiting. Truth in advertising would be better served by simply labeling the film The Flustered Birds Movie.